For years, iconic fashion designer Marc Jacobs was adamantly anti-social media. That was until he signed up for Instagram two years ago. “As soon as it was recorded and documented that I was against it, the next day I joined Instagram. Like fashion, you love it ’till you hate it; you hate it ’till you love it,” said Jacobs. 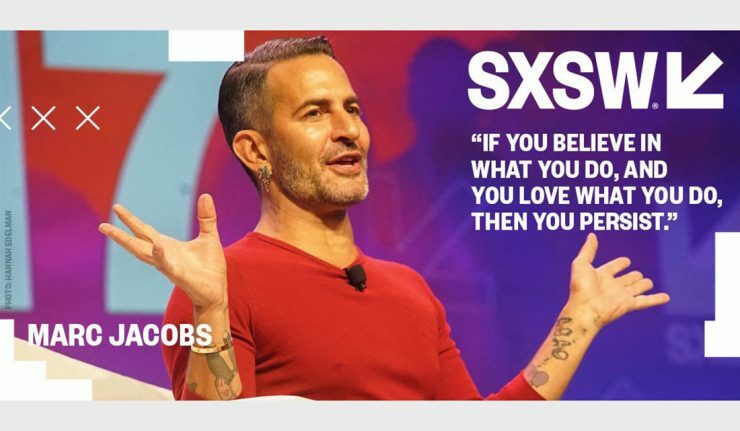 At his Monday session at SXSW, “The Fashion Designer in the Age of Social Media,” Jacobs discussed how he balances his personal Marc Jacobs account with the Marc Jacobs brand and explained how characteristics of social media can often parallel fashion industry. “If I post something on Instagram, it’s because I decided to embrace something, and I agree to accept the response and reaction. The same is true of a fashion show – if I didn’t want a reaction, I wouldn’t show it to an audience,” said Jacobs. Jacobs recounted a recent reaction his bold finale to New York fashion week in February where he asked guests to refrain from any photography and social media posts. Once models walked down the catwalk in silence, they proceeded to Park Avenue to sit down, take out their own phones and photograph the spectators themselves. “I can’t force people not to use their phone or refrain from taking pictures. I just wanted to slightly suggest that people put away their phones. Most people were willing to do that,” Jacobs said. With a personal following of over 700,000, Jacobs said his Instagram audience can’t be “cast” like his fashion shows can be, so life online can be a little more instinctive and spontaneous. Jacobs said he gets more “likes” for photos of his dog or food, and certain types of content appeal more to his larger online audience. When asked about his favorite Instagrammers to follow, Jacobs mentioned @EarlBoykens, which features “hilarious” photos of animals “doing funny things like jazz hands.” He also referred to @MichelGaubert as being an inspiration. Jacobs closed his talk by saying he’s not too tech-savvy, but technology and science is “hugely important” to the future of fashion.